IKEA’s Home Tour Squad is heading to an East Coast city near you, giving homeowners a chance to have their abodes transformed by experts. A team of five IKEA designers will not only make chosen living spaces way more efficient, they will also offer advice about the best way to maximize space. Hit the jump to find out how you get your home made over. We’ve all plopped down onto the comfy couches that the IKEA has set up in their faux-living rooms, imagining our own abodes to be as expertly organized and pleasing to the eye. 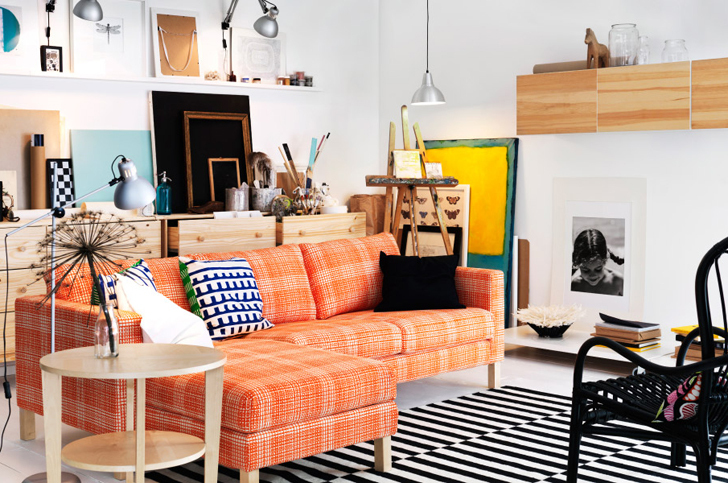 Now, some of us may get the chance to snag some Swedish design for our own homes with the IKEA Home Tour. Like a makeover television show, the experts will be hitting the streets of New York, Philadelphia, Charlotte and the Baltimore/DC area to transform homes with the classic IKEA sensibility – combining efficiency and style. Selected homes will get the works, with the results presented on the IKEA Home Tour YouTube Channel. Home owners will also get important tips to spruce up their own homes. New Yorkers can submit their videos at the IKEA Home Tour website from June 2 to July 6, 2014 for a chance to win! I really need a home makeover because this my first time moving into a actual house (all my life my family and I lived in a apartment). This is also the first time I am getting my own room after such a long time. I really would like to get a makeover for my house especially because we can't afford a lot of things ! It's not really a home makeover it is a garage to makeover . I bought a house for investment for my son when his father passed away.the garage already had a bathroom in so I figured we could make an in-law quartes for me. Well I became I'll and now on disability and don't have enough money to finish.ssd just don't bring in that much money. Now needless to say I have no shower ,that's where it stopped redoing that. All my little dreams vanished,but I am alive.so this would be so great to have this makeover.i would love my (house)/garage to be my HOME.......thank you for listening and grateful for people like you to have someone's dream come true. I PURCHASED A 3662 SQUARE FOOT HISTORICAL HOME NOT ONLY FOR THE PRICE BUT FOR MY HUSBAND, MYSELF, AND SIX GRANDCHILDREN THAT WE ARE NOW RAISING FOR REASONS OUT OF OUR CONTROL. WE DEFINITELY NEEDED THIS SPACE BUT NOW WE NEED THE RESTORATION. Pleeease I need a home make over urgently!! Love ikea design ideas and would like to get help with family friendly open space kitchen/dining room /living room design! Please! The closest IKEA store to me is in Dallas. I live just outside Oklahoma City and shop in the Dallas store every chance I get. I am a first wave Baby Boomer, downsized to a smaller home and my home office is a disaster. Does the IKEA Home Tour only go to the East Coast? I need help! I need mine done please. My mother had it done she passed an some one broke in and discarded it. I need a place back home to stay. When should Philadelphians post videos?